Maggi is a type if Instant Noodle, so famous in Malaysia that all Mamaks (Hawker stalls) sells their own version of Mggi Goreng. 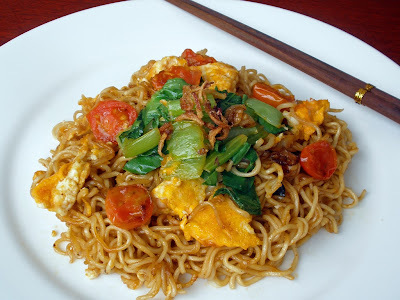 Google Maggi Goreng and you see a gazillion of versions of this fried instant noodle popping up. Goreng means fried. It comes in different flavours but making Maggi Goreng with curry flavour ones is pretty famous and they are to me, the most delicious one too. I recreated this version by my years of watching how those Mamak fellows do it. My sisters and I used to really like Maggi Goreng and always buy them on a weekly basis. 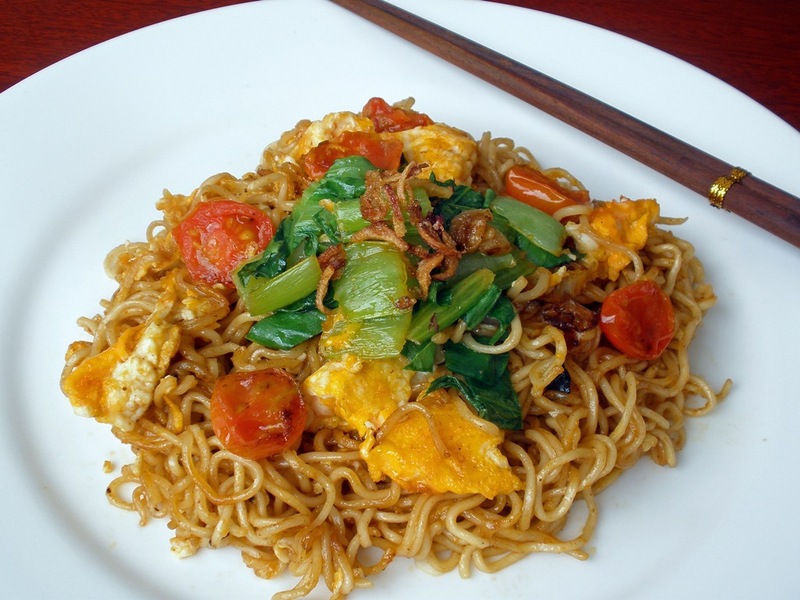 Among ingredients that goes into a typical Maggi Goreng includes tofu puffs, greens such as choy sum, tomato wedges and egg. Some also add meat pieces to it but I've made a vegetarian one today and I use cherry tomatoes because I don't have whole tomatoes. You can use two packets of the Curry Flavour Maggi Noodle and add one plain noodle to it (these can easily be bought from Chinatown under the brand name Vitz) or just cook for one and don't use up all the seasonings. Aaron likes his with the whole sachet of seasoning but I find it will be too salty to my liking. It's really down to how salty you can take. Blanch the Maggi noodle in boiling hot water for just 1 minute. Basically, you want it to be partially cook because you will stir-fry it later. Remove from water and drain well and loosen up with fingers. Heat up the oil in a pan and when hot, add in the shallots and toss until golden brown. Add in the tomatoes and greens and toss to cook for a while. Add in the noodles and sprinkle over the sachet of seasoning that comes with it. Toss to coat well. Push to one side and pour a little more oil in the wok and crack in the egg. When it is half set, toss the noodle back to the centre and coat and mix with the egg. Dish up and serve immediately. 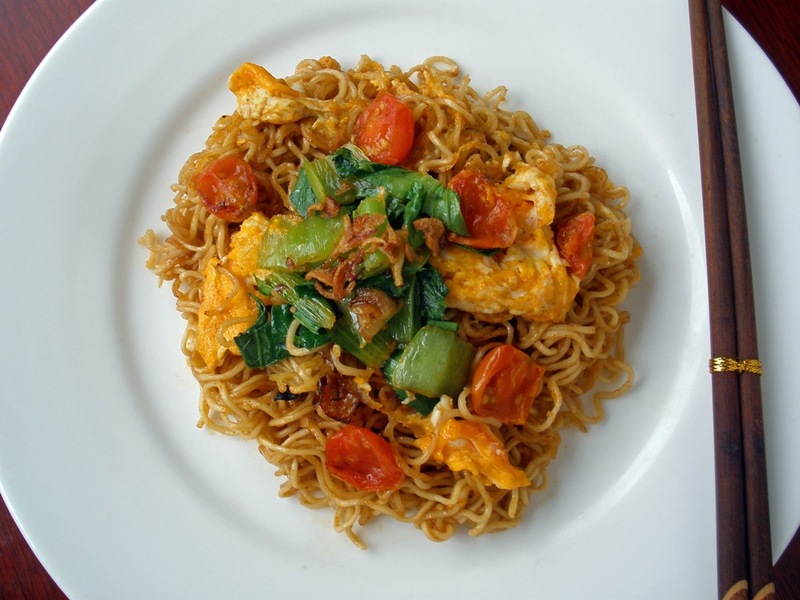 Maggi goreng, my simple vegetarian version. Easy? If you want to add meat to it, add it when the shallot is lightly browned. Aaron's favourite....seriously, he can eat this every morning and still not get bored! hi Quinn, this recipe of yours looks amazing! I never tried cooking with the maggi goreng noodles before. Your photo makes me want to try it soon! I like maggi goreng especiall with this brand "Maggi". Sometimes when I have no idea what to cook, I'll cook this too! Very appetizing! Thanks for the recipe! Last time I cooked Maggi goreng it turned out soggy. May be because I used the American ramen brand which noodles are more densed and also cause I boiled the noodles till it was done. haha looking at your Maggi Mee goreng reminded me of those day when I was too lazy to cook...this is what I will present for dinner to the Piggies :) Yours look so delicious no wonder Aaron won't mind having it every day ! Awww Elin, you made me so happy! Haven't had maggi goreng in awhile! This looks so good!